Whistleblowers who come forward to protect public health and safety are shielded from retaliation by a number of state and federal laws. Public health and safety whistleblowers can help protect the public by filing complaints, and whistleblowers who report public health and safety violations are legally protected if their employer takes retaliatory actions. Public health and safety whistleblowers are protected by the Occupational Safety and Health Administration (OSHA) at the federal level and by state laws including New York Labor Laws 740 and 741, and New York Civil Service Law 75-b. A New York employment lawyer can help protect your rights if you are a whistleblower. Multiple laws at the federal and state level protect whistleblowers who speak out about public health and safety violations. Whistleblowers may be covered under different laws depending on whether they are public or private employees and the types of violations they are reporting. For example, New York state has three different whistleblower laws depending on whether the whistleblower is a public employee reporting illegal government actions, a public or private employee reporting a public health and safety danger, or an individual performing healthcare services. Whistleblowing means coming forward to report a violation of the law. In the case of public health and safety whistleblowing, whistleblowers help protect the public by reporting corporate or government actions that put the public at risk. A number of laws protect whistleblowers, depending on the type of conduct they report and to whom they report it. The most common forms of public health and safety whistleblowing have to do with OSHA violations and healthcare violations. Federal and state law protects public health and safety whistleblowers. At the federal level, OSHA, the Occupational Safety and Health Administration, enforces whistleblower laws, and at the state level, Labor Law 740 protects whistleblowers on public health and safety matters. An employee of a railroad company witnesses a violation of the Federal Railroad Safety Act, such as a hazardous safety condition, and reports the violation either internally at the company or to a law enforcement agency. An employee at a consumer product company has evidence that a new product does not comply with consumer safety rules or contains a defect that could create a substantial risk of injury. An employee at a food manufacturing company hears reports that contaminated foods have been knowingly shipped out to customers or that food products are being stored in a facility infested with flies. An employee at a manufacturing facility is concerned that one of the machines may be hazardous to workers, potentially leading to injury or death, and reports the potential violation to OSHA. Federal and state law protects whistleblowers who speak up about healthcare violations, including actions or policies that may harm individual patients or public health and safety. The laws also protect people reporting healthcare fraud. New York Labor Law 741 provides added protections for whistleblowers employed by organizations that provide healthcare services, such as schools, nursing homes, and hospitals. An employee at a health services company is concerned that a standard practice may be harmful to certain patients, and reports or threatens to report it to her employer. An employee refuses to participate in an employer policy or practice which the employee reasonably believes constitutes improper quality of patient care. The employee is protected as a whistleblower. A doctor learns that one of his coworkers has an alcohol addiction, which the doctor fears may affect his coworker’s ability to care for patients, and could cause harm. The doctor reports the coworker to his employer. If you act as a whistleblower and report a violation, you have legal protections. 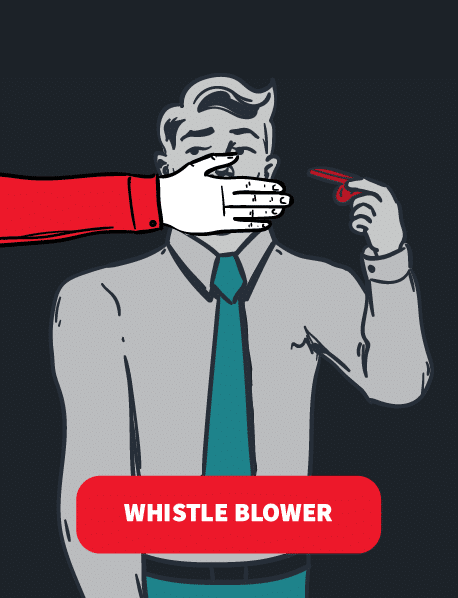 Employers often retaliate against whistleblowers. The law provides protections and relief from these retaliatory actions. Retaliatory actions by your employer can include firing, demoting, suspending, threatening, harassing, or discriminating against an employee who has reported healthcare fraud internally or externally. In addition, New York state laws protect both public and private employees from retaliation. If you are the victim of retaliation, you can receive reinstatement, back pay owed, interest on the back pay, and compensation for any damages. This may include litigation costs and reasonable attorneys’ fees. Whistleblowers can report public health and safety violations, including healthcare violations, to a number of government agencies, depending on the type of violation. Whistleblowers who want to report health and safety violations committed by companies can contact OSHA to file a report. If employers take retaliatory actions, whistleblowers can contact OSHA or file a claim in state court. Many of the laws covering public health and safety whistleblowers require them to take specific actions when reporting potential illegal activities. In order to gain the protection of whistleblower laws, employees should make sure to comply with the law’s requirements. For example, in order to be covered under New York’s Labor Law 741, the employee must first report the improper patient care concerns to the employer, in order to allow the employer to correct the activity or practice. This is waived, however, if the employee believes the violation “presents an imminent threat to public health or safety or to the health of a specific patient.” Other laws do not require prior reporting to the employer. OSHA enforces a number of federal whistleblower protection statutes. Each has a different statute of limitations for reporting retaliation. Complaints must be filed with OSHA, orally or in writing, within a certain number of days after the retaliation occurs.